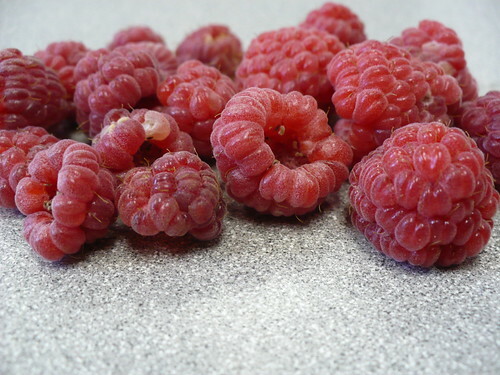 Our poor, sickly raspberry plants are suffering through the heat and are beginning to produce a few berries. Even in good health the weather is still just a little bit too hot for really good berries and with the root rot issues it is definitely too hot. The berries are going from under-ripe to over-ripe in the course of several hours. As I got looking at the plants, I discovered that not all of the canes are in terrible shape from the Phytophthora Root Rot. We’ve lost about a dozen canes from the center of the plant, and there are more that aren’t looking too good. But…there are some canes toward the back of the patch that are still pretty healthy! If you look close, you can see that the berries on the left are about half the size of those on the right. That’s a great example of 2 things. First, the importance of healthy plants. Second, the importance of adequate water getting to the fruit during ripening. That’s the true damage of the disease right now, is that water can’t get all the way to the top of the canes, so the leaves are scorching and the fruit is small. Posted on July 26, 2010, in Plant Problems & Diseases and tagged berries. Bookmark the permalink. Leave a comment.